Considering the importance of our products, the packaging is one thing, we give utmost importance to. Whether it is storage or the delivery of consignment, we strictly follow the international norms and keep the products free from dust and moisture to prevent them from rust and corrosion. For an unscathed delivery of our products, we have a state of the art packaging unit, where products are checked and packed in wooden boxes/corrugated boxes. And in order to ensure the safety of the products, each and every item is wrapped in foam, cloth etc and put in the wooden boxes, which are properly marked for proper handling during the transit. 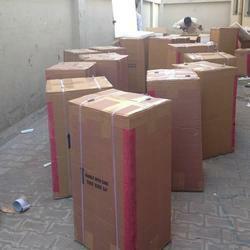 We have tie-ups with major C&F companies that ensure timely deliveries. Due to our rich infrastructure, we have been able to meet and manage the requirements of our valuable customers in the most efficient manner. Divided into different units, our infrastructure is well-equipped with the latest machinery and is known for its large-scale production. Built over 550 sq. meters, the facility is equipped with the latest machinery for the online assembling of suction machines in dust free environment. The factory organization includes different divisions, such as production, assembly, testing, clean room and R & D.